Incoming and returning law students are often interested in finding apps to support their studies in law school. Here is a post from the blog, updated to include new editions. I hope you find these suggestions helpful! Image courtesy of lordjiew at freedigitalphotos.net. In a previous post I talked about how to create checklists to study for final exams in law school. Many of the techniques that work in law school are also helpful on the bar exam. In the final days before the bar exam, you are most likely reviewing your commercial outlines and taking practice exams. Maybe you have created some flow charts or flashcards to help you learn the material better. A checklist is a simple, quick way to focus your studies even more. So how should you create bar prep checklists? You will create one checklist for each subject. Go through the outline, creating a quick list of all topics and subtopics—if the outline has a table of contents, this process can be even quicker. Don’t include any details–your checklist should be made up of key words and phrases, not tests, definitions, or other detailed information. Try to fit your outline on one or two pages. (You can create columns if necessary.) It shouldn’t take very long to create the checklist for each subject. 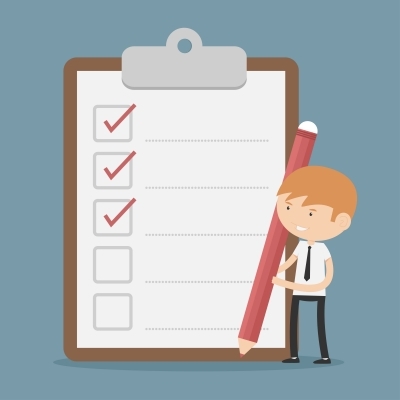 (1) Use your checklists to evaluate what issues you need to focus on during your final days of bar prep. For each item on the list, ask yourself: Do I know the law related to this issue? If I see this issue on the exam, am I prepared to analyze it? If yes, cross it off the list. Bar studiers often study by reading through the entire outline over and over again, but this is an inefficient way to study. You want to focus your attention on the issues that you aren’t as comfortable with, and the checklist helps you to do that. The next day, print out a new copy of the checklist and go through this process again. You should be able to focus your attention on fewer issues each day. (2) Use your checklist to think about the relationship between legal issues. Sometimes when you are studying from an outline, it is difficult to see how issues relate to each other. But one of the keys to spotting issues in an essay question is understanding those relationships. Because a checklist strips everything away except for the key issues and sub-issues, it is easier to identify those relationships. (3) If you commit the checklist to memory, you can use it on the exam to spot issues. It may not be possible to memorize every checklist, but usually bar studiers have trouble identifying issues for some subjects more than others. For those more difficult subjects, a memorized checklist can help you stay focused if you get an essay question on that subject during the bar exam. Checklists are a quick and easy tool for focusing your studies in the final days before the bar exam. I wish you the best as you study for the bar!